03/28/2018 Partial Re-tensioning: AGGA is only partially re-tensioned because Dr. Kundel thinks expansion is occurring too rapidly and wants to give gums and bones a chance to catch up. 04/13/2018 Measurements: AGGA gaps are 4.7mm (right) and 6.3mm (left), an increase of .2mm. This movement makes sense because AGGA was re-tensioned (although only partially) two weeks prior. 05/05/2018 Measurements: AGGA gaps are 4.7mm (right) and 6.4mm (left), an increase of just .01mm. I had never recorded such a small amount of growth, which suggested that for the first time since installation there had been almost no tension on AGGA for the prior 2 weeks. This made sense because only a partial adjustment had been made on March 28, 5 weeks prior. 5/10/2018 Lip Tie Release: Dr. Kundel performs upper and lower lip tie release, but chooses not to re-tension AGGA for an additional 2 months. 07/10/2018 First Re-tensioning Since 03/28/2018: AGGA is finally re-tensioned again after a 3 month halt. 07/10/2018 Measurements: AGGA gaps are 5.7 mm (right) and 7.2mm (left), an increase of almost a whole millimeter since May 5. This was unexpected and is quite mysterious because there was almost certainly no tension on AGGA during the period that this 1mm of growth occurred. How is this 1mm of Movement Possible? 1. Momentum: According to Dr. Kundel this continued growth occurred as a result momentum that had been generated by AGGA during my first 5 months wearing the appliance. For the first 5 months AGGA was re-tensioned regularly, once a month. Growth during this period was very robust, with the maxilla moving forward about 1mm per month on average. During the 3 month halt period that just ended 1mm of growth total occurred, which is only 33% of the growth rate of the first 5 months. But 1mm of growth without any tension on AGGA is substantial nonetheless. 2. 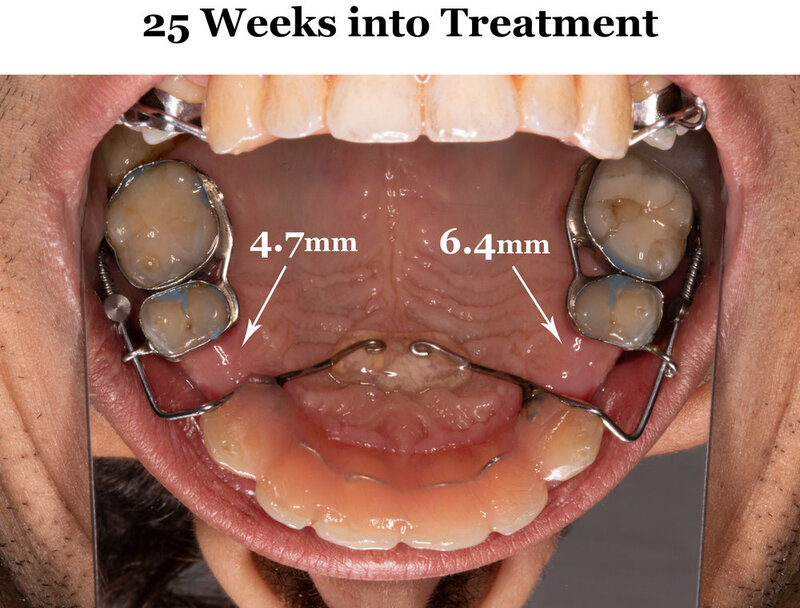 Lip Tie Release: Dr. Kundel also suggested that the lip tie release he performed at my May 10, 2018 appointment facilitated the 1mm of growth that occurred during the halt period. Could it be that cutting my upper lips away from my gums along the base of the incisors somehow liberated my maxilla to move forward? Could it be that my "tied" upper lip was holding back my maxilla to such a degree? Do prior momentum and lip tie release explain this unexpected 1mm of growth? I really don't know. Let's just go ahead and add it to the list of AGGA mysteries. On July 10 my AGGA was re-tensioned again in pursuit of more maxillary growth. Dr. Kundel and I are proceeding with caution but feel confident that more growth is both desirable and possible. I do not know how much farther forward we will attempt to go. Here's what my incisor tilting looks like 34 weeks into treatment.